We just came back from the DAX Show in Minneapolis. While we were at the show, as usual, we fielded quite a few questions about stabilizer. It seems that stabilizer is one of the things about embroidery that can be confusing for those who are just starting out, or for those who haven’t had much exposure to the variety of specialized stabilizers that are available. Since everyone who reads this blog wasn’t able to be at the show and hear our explanations there, I figured I’d share the information here as well. First, let’s define what a specialty stabilizer is. In general, a specialty stabilizer is one that is developed for a particular type of embroidery, to perform a particular function or to work with a particular type of fabric or embroiderable good. A specialty stabilizer is often used because it will increase the quality of the finished embroidery in some way. There are a variety of specialty stabilizers available, and covering each one in depth would result in a blog post that was miles long, so I’m just going to try and give you an overview of the common options and the reasons why they are used. 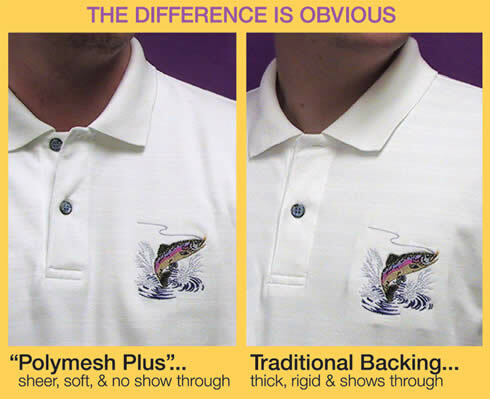 Poly Mesh – Poly mesh stabilizer is a light weight, textured stabilizer that is great for t-shirts and light weight fabrics. The texture allows for the support of a large number of stitches, but the light weight ensures that the garment or the embroidered design won’t be distorted by a large wad of backing. Fusible Poly Mesh – Fusible poly mesh is the same material as regular poly mesh, with the same light weight feel and the same texture. The difference is that fusible, as the name implies, can be fused, with heat, to the back of a garment. Fusible is useful for infant or children’s clothing, covering embroidery that might otherwise scratch delicate skin. It can also be used with performance wear, to stabilize and help eliminate the stretch in these types of fabrics. Adhesive – Adhesive backing is coated with an adhesive which is covered with a release paper. This type of backing can be hooped, after which the release paper is scored, exposing the adhesive, and allowing for the securing of small items which couldn’t otherwise be hooped, like patches or socks. Adhesive backing can also be another option for performance wear, functioning as a barrier against the stretchiness of the material being embroidered. Water Soluble – Water soluble stabilizer can be a backing or a topping. As a topping, water soluble is used on top of fabrics that have a pile. It is commonly used on fleece or towels and works to keep the stitches from sinking into the pile and disappearing. Another type of water soluble, called Badgemaster, is thicker and used for making free standing lace. Cutaway/Washaway – Another option for free standing lace is a cutaway/washaway backing. This type of stabilizer can be used to create free standing lace ornaments, as it can be embroidered and then the excess can be dissolved away. Cutaway/washaway can also be a good option for when the back of an embroidered item, like a monogrammed towel, for instance, might be seen. The excess stabilizer will wash away over time, leaving the back of the embroidery tidy. Cap Backing – Hats are a popular item with many embroiderers, and cap backing makes embroidering a hat easier. This type of backing is usually 2.5 to 3.0 ounces, and is often offered in smaller sizes like 4 x 7. Cap backing is a stiff, paperlike tearaway, which tears cleanly, and is stiff enough to support stitch heavy logos. Some embroiderers will tell you that specialty stabilizers aren’t necessary, that a simple cutaway or tearaway will get the job done in almost any situation, and they wouldn’t be wrong. What specialty stabilizers offer is the ability not just to get the job done, but to get it done in a way that works with the fabric and creates a finished design that is really a work of art.